When people picture a backyard swimming pool, they often think about lounging in the sun, splashing and playing with family members, and hosting pool parties, but overlook another useful function. Your pool provides an opportunity for a great workout! Traditionally, people have chosen to install full-sized lap pools for exercise, but new innovations make smaller pools a possible alternative for working out. Which type of pool, a swim spa or a lap pool, is right for you? Lap pools need to be at least 40 feet long, 10 feet wide, and 4 feet deep to be considered full sized, although some are larger. Most lap pools are in-ground, although less expensive aboveground options may be available to you. Pros: They provide an exceptional environment for distance swimming, which creates long, lean muscles and tremendous cardiovascular strength. Lap pools obviously have a pre-measured distance, which makes it easy for you to create and run speed and endurance drills, increasing your overall fitness. You can incorporate a kickboard to focus on working out your legs or a pull buoy, which is held between your legs and forces you to use your arms for propulsion. A lap pool’s large size makes them versatile, allowing recreational use for splashing, floating, or even hosting a party. Cons: Lap pools can be very expensive. The sheer size of the pool creates large construction costs, and upgraded materials such as tile just add to the overall expense. More water is required to fill them, which then means more chemicals and a higher capacity pump and filtration system are needed to keep the pool clean and healthy. Security fencing and pool covers will also be more expensive due to the size of the pool. Swim spas come in all shapes and sizes. Many of them are premade of fiberglass or other materials, and can be selected to suit the activity or activities you plan on pursuing in them. Pros: Swim spas can be drastically less expensive than a lap pool. The pre-made ones are not unlike hot tubs, which can be relocated if you move. If you want to swim laps, many swim spas are equipped to create a never-ending current that pushes back as you swim forward, allowing you to “lap swim” in an area that is only a little longer than you are tall. If you won’t want to purchase a specialty pump, there are also restraint systems that use tethers to hold you in place while you swim. The high capacity pumps are sometimes designed to minimize the amount of chemicals the pool needs in order to keep the water clean and healthy. Swim spas can also be purchased at varying depths, which allow water aerobics aficionados to use their favorite moves at home. Cons: Some swimmers dislike swim spas because they prefer to be able to count laps instead of swimming in place. 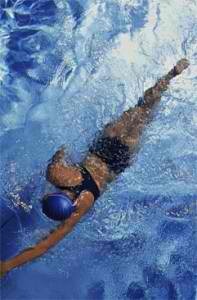 In particular, distance-driven swimmers may find that demotivating. The smaller size of the pool minimizes its impact on the landscape, whereas a larger pool is typically a prominent and beautiful feature in the yard. The smaller size also limits the number of people and activities that can take place in the pool at one time.